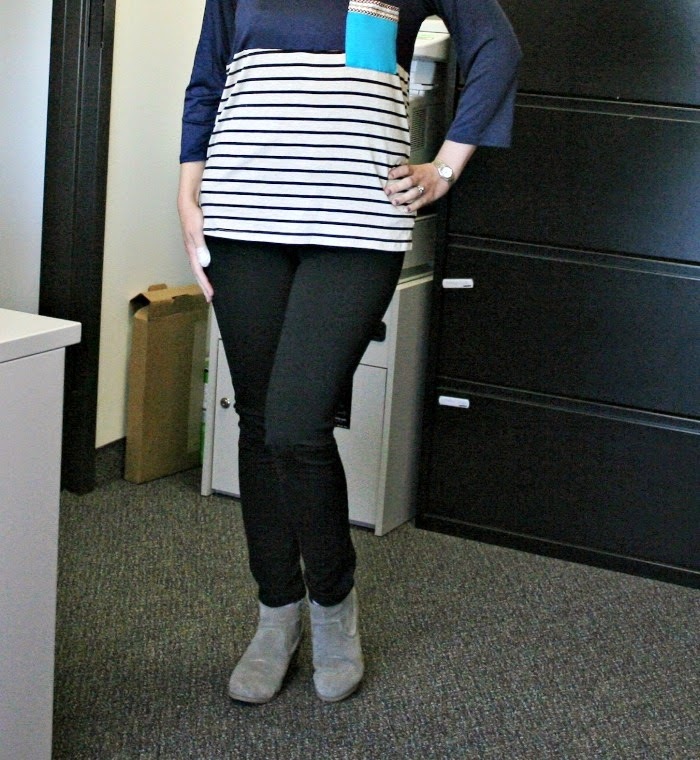 So you may remember earlier this year I jumped on the Stitch Fix bandwagon. I thought it was a lot of fun and really enjoyed the fixes I received. It is expensive, but it is a nice treat every now and then and I loved having someone else pick out clothes for me - especially while Ollie was much smaller and harder to take out shopping. I decided for the summer to put Stitch Fix on hold and scheduled myself a date in September, figuring I'd cancel it if I decided I didn't want it. And I fully intended to cancel it because I really truly am trying to save money - but then I forgot to go in before they shipped it. Oops! In the end I'm glad I got a fix this month and I actually really, REALLY struggled with what to keep and what to send back as I really did like most all of the items, but decided even with the 25% discount to keep everything, I still had to make some choices. So, here is what they sent and what I kept/returned. At first I was really not a fan of this sweater, but the more I wore it around it did grow on me. 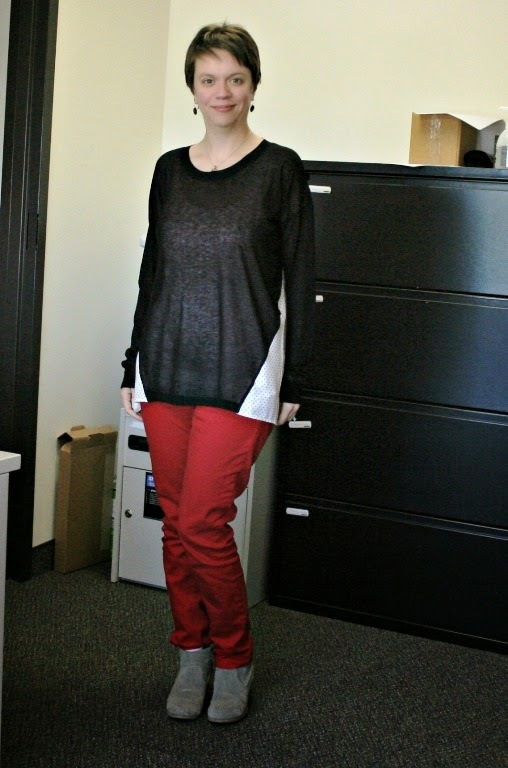 I liked the style suggestions of wearing it with black leggings or dark jeans and I thought it even looked cute with my red jeans here. 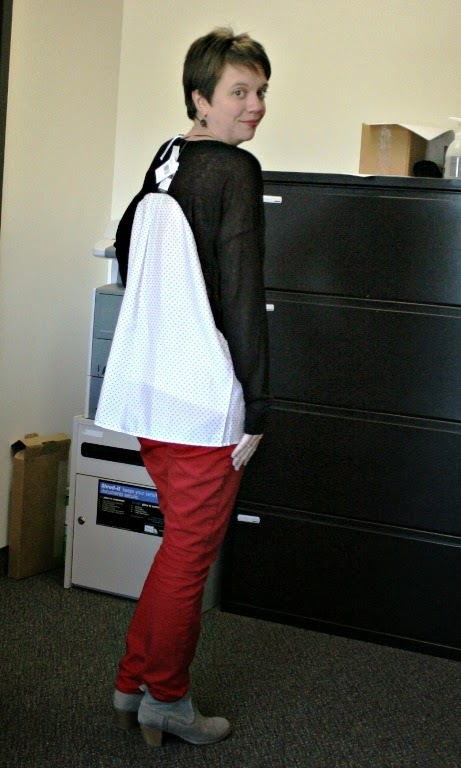 It's a bit of a blouse meets sweater and is a nice "dressy" alternative to a regular sweater. In the end, I decided even though I did like it that I would send it back. I have two polka dot blouses that are similar to the silky portion of this sweater and a black cardigan and I think I could sort of duplicate the look that way. I loved this one right out of the box actually. I love the stripes, the colors, the fit, everything. But it is extremely similar to another top I just thrifted on Labor Day and I decided in the end, I do not need two shirts that are SO similar. 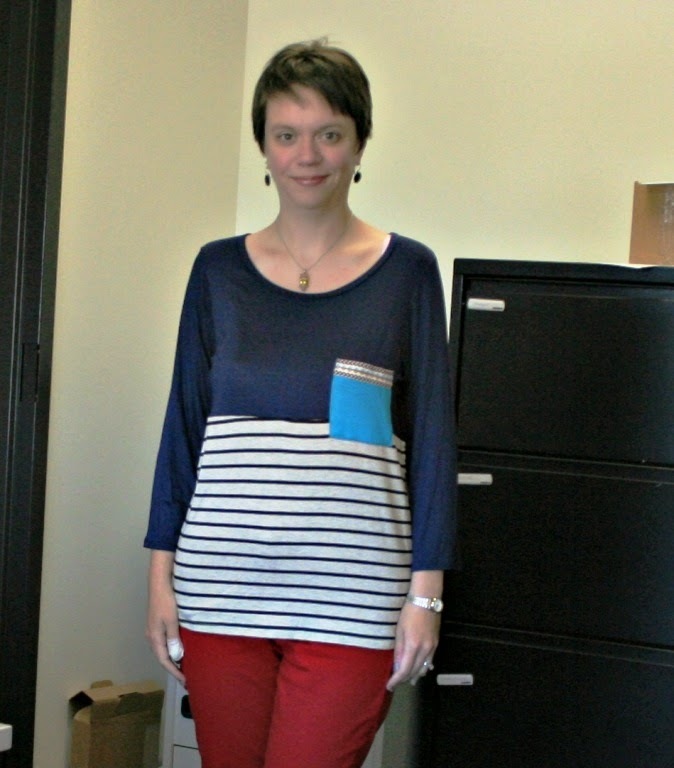 It was a tough choice though, you know I love my stripes and the cute pocket on this one was a fun addition! 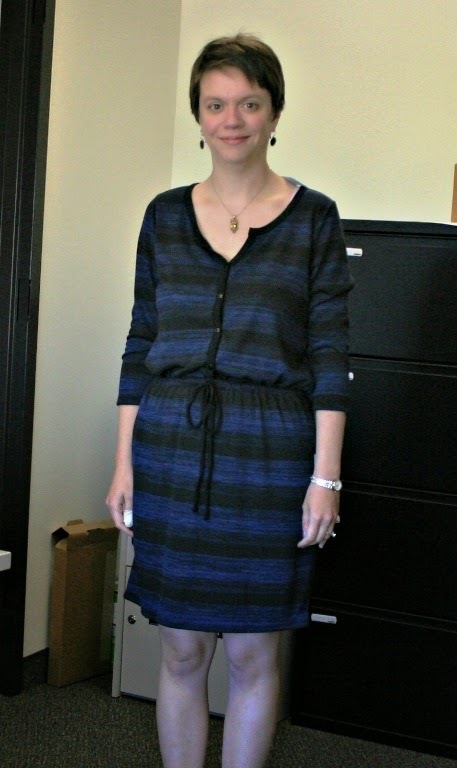 I can't resist a good dress - especially when it fits well, it's comfy, it's totally me and it will work well for nursing as noted by my stylist (love that she paid attention to those details!) While I may only be nursing Ollie for a few more months, I still think this dress will go pretty far for me. It will be super cute with a jean jacket and boots. Love, love, LOVE. This was another HARD choice for me. I love bags. We all know that. I specifically requested a bag in this fix because I've been seeing them in other fixes and I thought it would be fun to see what kind of bag they'd send me. My stylist chose this one because it is the ultimate carryall and would be great for day to day and even double as a baby bag. She is definitely right about that. 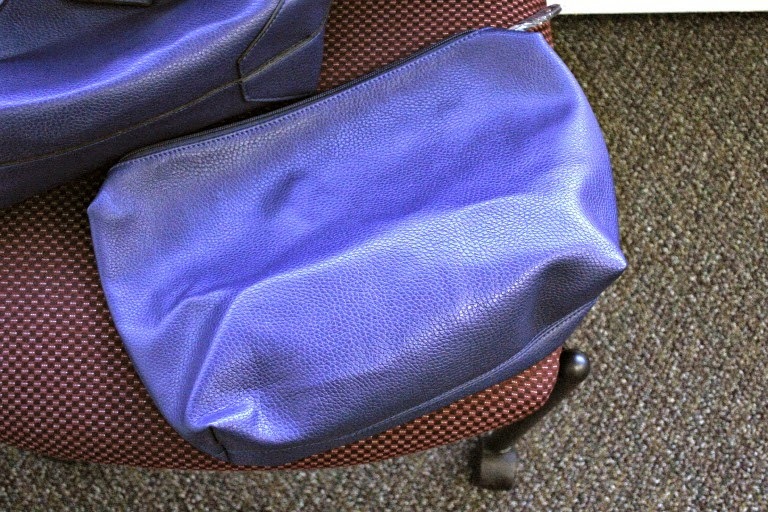 I love the color, the removable zipper pouch and the fact that it is reversible - you can turn it inside out and make it purple instead of blue. In the end though, I am not a tote fan. I like hobos, satchels and crossbody bags so much more. 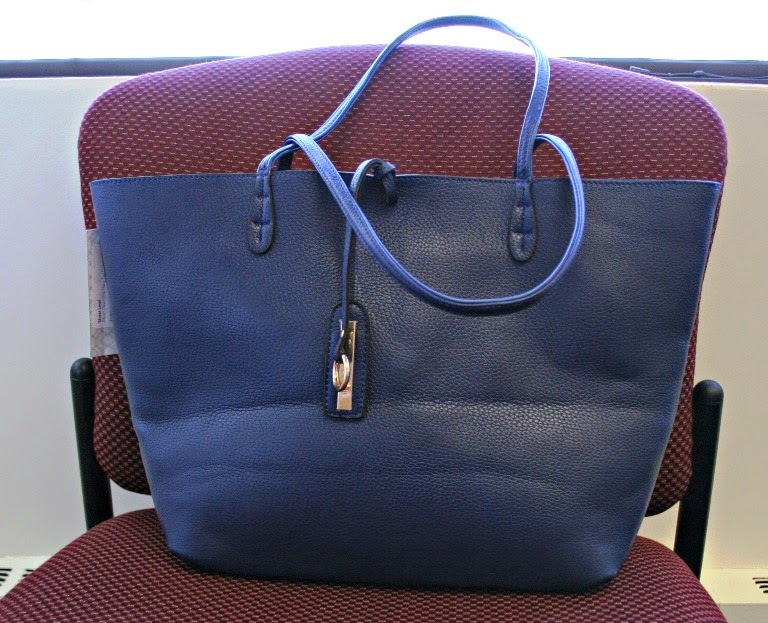 Any tote style bag I've ever used ends up frustrating me. It's just not my style. I really appreciated the thought my stylist put into picking this bag out, but it just wasn't meant to be. I'm getting very picky about my bags and really my style in general, so I couldn't justify keeping it just to see if I'd end up liking it. This one was a matter of price for me. I love them, I love the fit, I could stand to have another pair of black leggings, but these were just so spendy and if I was already returning so much of the fix, it would just be too much to spend for both these and the dress. I love the dress more, so I chose to just keep that. I am pretty sure I can find another pair like these at Old Navy or Kohls. Overall, while I did choose to send pretty much this entire fix back, I thought the stylist did a great job. She studied my Pinterest boards which I really appreciated. She took my feedback from my old fix into consideration and she really did pick items I enjoy. The problem was simply trying to budget and trying to not duplicate items in my closet too much. I have decided to schedule another fix around my birthday and I am requesting the same stylist, I think she did a great job. It was a lot of fun to try all these things on even if I decided to not keep most of them! Do you think I made a good choice? Just a friendly reminder if you haven't tried Stitch Fix yet and would like to, I'd love it if you used my referral link here: https://www.stitchfix.com/referral/3528162. If you have tried Stitch Fix, did you get one this month? What was in yours? That dress is perfect on you! I love it. Great choice!!! OH! I absolutely love this dress! I always want to try this for the fun of the surprise, but then I also love picking out my clothes so much. I am also horrible at returning things, so I feel like I would accidentally keep everything even if it didn't fit right or I didn't love it! Yes, I think you made the best choice--I was looking through and thought "I hope she keeps that dress" and you did!! I agree that you can probably find leggings like that for a better price somewhere else. Can't wait to see all the ways you wear that dress!